Some of you have been using custom theme colors, which are not available anymore. Why? 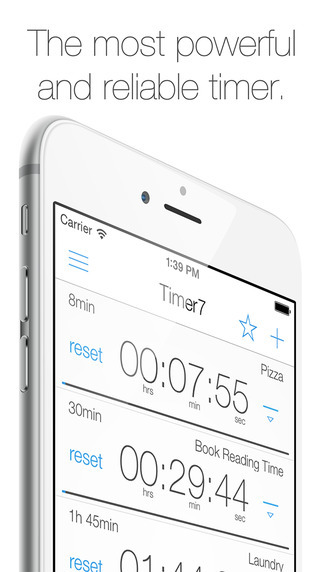 With an upgrade in near future you will get an option to custom color code each timer. To keep the design coherent with that functionality i decided to transition to all white background. If you would like a 'dark' theme, email me. If there is enough interest, it will be included. Please, rate the app! I know it's annoying but due to the way App Store works, it's the single most important thing keeping the app on the App Store and the updates coming. If you have comments or suggestions, write to me at sasa.mencinger@me.com. I reply to every email. Thank you for purchasing the app! Do you hate marketing talk and small print tricks? - 0 taps for creating first timer. It's always there for you, waiting to be set! If you need glasses to read, you might have trouble using it. Current thin font design trend is aesthetically plesing but hard to read. I personally do not like it, but majority wins. After a number of starts and days, the annoying "rate this app" will pop up. I personally don't like it and rated only a few apps i truly loved - when i wanted. So why am I bothering you with this? Due to the way App Store ranks apps, there is absolutely NO way to get any visibility without massive amount of ratings. Because everyone does it, I am unfortunately forced to do it too. The idea is to keep it SIMPLE, CLEAN and EFFECTIVE. Open the app, set it in a heartbeat and go on with your life until the notification pops up. Add wrong features - and simplicity is lost. The way utility apps should be! 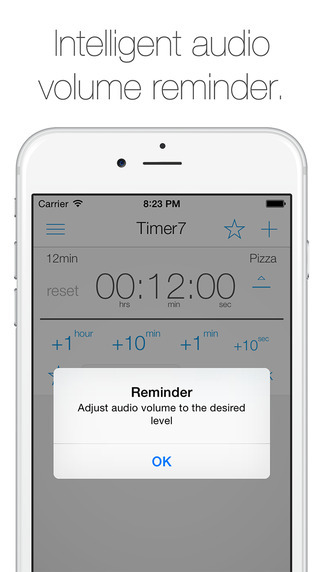 To give you the BEST overview possible, the main screen is reserved only for active timers. Timers which were set but never run are removed upon app/phone restart. To save a timer tap the star and it will be saved to your favorites list. From there you can select AND start it with a single tap!